carbon dioxide production | Climate S.W.A.G. Q: What country is the largest source of global warming pollution? A: The United States. Though Americans make up just 4 percent of the world’s population, we produce 25 percent of the carbon dioxide pollution from fossil-fuel burning — by far the largest share of any country. In fact, the United States emits more carbon dioxide than China, India and Japan, combined. Clearly America ought to take a leadership role in solving the problem. And as the world’s top developer of new technologies, we are well positioned to do so — we already have the know-how. Al Gore used similar data in his 2006 film, An Inconvenient Truth. Both Al and the Environmental lobby are wrong. Big Surprise! They must be using ancient data. The data used by Mr. Gore in his 2006 released film has a 1999 copyright date. Data takes time to compile. I’d guess the actual data was probably produced using data form the mid 1990’s. 2014 data is now available . I wish the Natural Resource Defense Council had spent a bit more on content editing and a bit less on online advertising. The Statistica website has data from 2014. Their data shows the USA is second place with 14.7% of total manmade carbon dioxide production. China leads and has led the country chart since 2006. Their 2014 share was 23.4%, a number that has been steadily rising for over 20 years. India, another rapid grower sits in third position with 5.7%, followed by Russia (4.9%), Brazil (4.7.%), Japan(3.6%), Indonesia (2.31%), Germany (2.23%) and Korea (1.71%). Why did Al Gore use old statistics in 2006 when he made his film and why does the USA’s largest environmental lobby still use 20 year old data today? Because it works as a fundraising tool. Potential givers want to feel important. China (and India too) have the ability to overwhelm the mathematics. Why give. We in the USA are powerless to impact the autocracy that is China. China is a bit closer to the equator than the USA, which means they need to use less energy to keep warm. The USA has been reducing their carbon footprint steadily since about 2000. China continues to grow theirs at nearly 8% per year. India is another rapid grower and that has the potential to be a perplexing problem for the climate control crowd. India is about 1/3 the size of the USA and produces a bit more than 1/3 of the USA’s total carbon dioxide. Their population is still growing rapidly which means that their carbon production will grow rapidly unless they can use much less on a per capita basis. Their current per capita use is rising from a very low level which means that India has a long runway of increased carbon production in front of them. China’s impact is huge. India’s is growing rapidly. The USA’s potential climate impact (if you trust the UN scientists) has been declining for most of the 21st century. Who knows what will happen next. Any notion that we in the USA can change the world with rather modest changes at home seems a bit fanciful. Perhaps the guys at the UN are wrong. Their temperature predictions for the first 15 years of the 21st century have been awful. The world has been colder than predicted. Yes surface data shows 2014 as being a warm year. Satellite data disagrees; and both land based and satellite data are lower than UN predictions made just a few years ago. Perhaps increased carbon dioxide won’t be as damaging as advertised. China’s growth rate is slowing and they are building a bunch of new Nuclear Power Plants which should slow their emissions growth rate in the 2020’s. Maybe the elephant in the room will move more carefully a few years from now. On Saturday the Wall Street Journal published a feature article on the current state of climate science that was probably the best detailed article I have ever seen on global climate change. (the good). On Monday climate protestors amassed on Wall Street (the stupid). The article begins by acknowledging that the world is warmer and that man is probably responsible for some amount of warming. It then details all the shortcomings in the science. Discussions items include our limited understanding of the Oceans, the wild variability of computer models and the societal desire to have a precise answer when science cannot give us one. Precise answers are beyond our abilities at this time and yet the UN has been providing precise answers since 1997. It’s not what we don’t know that gets us into trouble, it’s what we know for sure that just ain’t so. The UN (when discussing global climate) has always been a political association trying to solve an extraordinarily difficult science problem. Political solutions don’t work well in science. The UN has been making specific predictions about future climate for some 20 years now. Those predictions have been wrong because they have not been willing to admit to the scientific shortcomings listed in the WSJ article just referenced. Natural climate variation and flawed computer modeling have made many predictions in the 2007 synopses report wrong. The recently released 2014 Synopses Report modified those predictions to include climate variation. Some changes in climate that were predicted for our immediate future now might not show up for centuries. But the predictions persist. 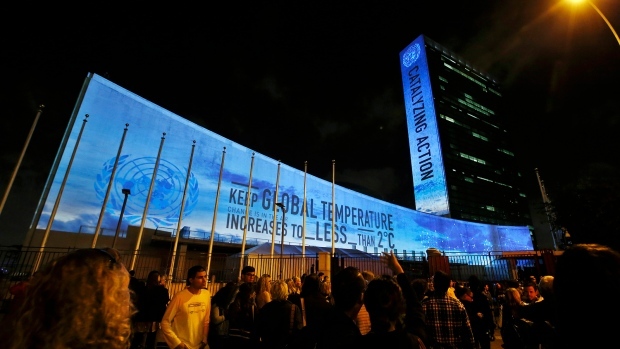 Keep global temperature increases to_less_than 2 degree C is plastered across the UN building encouraging protestors. This goal was a part of the 2007 Synopses report. The UN is supporting the notion that society can control temperature and can keep the change to less than a 2 degree C change since the beginning of the Industrial revolution. The world has already changed more than a degree C since 1750 so the goal is to keep temperature in a very tight range. Natural climate variation makes the goal virtually impossible. A few less sunspots, a volcanic eruption, a change in short term weather patterns. A Little Ice Age here, the Medieval Warming Period there, or perhaps the next ice age cold cycle. One volcanic eruption on the scale of the Mt. Tambora eruption of 1815 would change the world by more than 2 degrees C. 1815 was known around the world as the year without a summer. Europe in 1709 was a very cold place. It is guesstimated that Europe was a full 7 degrees C below the 20th century average that year. And the Romans built gold mines high in the Alps during a very warm period around 1800 years ago. Mt. Pinatubo in 1992 changed the world by 1 degree C in only 2 years. Any notion that man can control climate as specifically as the UN stated on their building last Sunday is poppycock and BAD science. Assume the UN is right and all the problems mentioned in the WSJ article are wrong (bad assumptions both). Gloom and doom is close at hand and immediate action is necessary. So activists protest on Wall Street? Why? What would that accomplish? What do they expect Wall Street to do? What are their goals? Carbon production worldwide is growing despite efforts to slow it. Why? Four words…China, India and Nuclear Power. We must find a way to slow the population growth rate and we must construct clean energy plants all over the world. Plants that will operate on cloudy windless days. There is only one choice that will work right now (if you believe the UN math), and that choice is Nuclear Power. Does the world fear Nuclear Power or global warming more? Right now the answer is Nuclear Power. Western countries are phasing out of Nuclear because of the Fukashima disaster. California and Vermont are closing old Nuclear plants and no new ones are scheduled to be built. That carbon free power is being replaced by power that produces carbon. China produces more carbon dioxide than the USA and Europe combined. And in the next 50 years India will become the world’s most populous place, adding half a billion people to its already burdensome population. Each additional Indian that makes it to the middle class wants to use energy to improve their quality of life. Cheap power is a necessity. China’s per capita production of carbon now exceeds the average for Europe. That production is rising at about 8% per year with zero population growth. India’s use is rising faster than it’s population growth. The USA, the world’s second largest producer of carbon, has been reducing production, but it gets lost in the mix as China overwhelms everything else. If India and China don’t change, then it doesn’t matter what the rest of us do. These are worldwide political problems. And they involve hard choices and tradeoffs. Wall Street has very little to do with either. So why protest there? Politics of course. And headlines! I’d be willing to bet that most of the protestors are absolutely sure they are correct….and I’d also be willing to bet they think all the science issues are settled. That is a sad reality that has become global warming politics. Much money has been spent in recent years studying climate change. We are oft bombarded with gloom and doom courtesy of these studies. Most studies I’ve read blame rapidly changing temperatures caused by man. Carbon dioxide is responsible for whatever disaster they happen to be promoting. Suppose, just suppose, that the climate hasn’t been changing as rapidly as advertised. Natural variation; here, there, everywhere. I particularly like the changes in the 1870’s and 1880’s. Ocean temperature data stunk back then (it’s not that great today) so we know the data used to prepare this graph is jam packed full of guesses. Climate change before 1950 is presumed to be natural climate variation by the same experts that are trying to scare us now. My personal favorite, the stretch from 1907 to 1943. It seems eerily similar to the data from 1976 to 1998. Fairly stable weather until Mt. Pinatubo erupted, then rapid cooling followed by rapid warming. And still no net change since the second half of1997. One key premise of man caused global climate change states that the climate will change more at the poles than in the tropics. It certainly has been true in the Arctic. I’d argue that soot and pollution from Asia (mostly) are partly to blame. Recent studies support this notion as does Satellite data from Antarctica. If the Arctic is changing due to additional carbon dioxide in the atmosphere, then Antarctica should change too…. and in a similar way. Take a look at the Remote Sensing Systems (RSS) Satellite data for Antarcita. Almost flat line. Now look at the Arctic Data also courtesy of RSS. No change in Antarctica, wild change in the Arctic. Ice core data supports the notion that the Antarctic has not been warming for hundreds of years. Hmmm. Most studies I’ve seen, including most IPCC handiwork, start with observed changes in the world around them. This change is then attributed to man produced greenhouse gases which is supported by computer models that assumed carbon was important. Round and round we go. Make an assumption and build a model based upon that assumption and then use that model as proof of the assumption….just a tad circular. If carbon dioxide is the primary driver of climate change, the data at both poles should be similar. The data has been diverging for the entire 36 year history of Satellite Data. Maybe, just maybe, something else is going on. This post is the third of 3 dealing with an article published on December 3rd by Dr. Hansen and 17 other scientists. The article’s basic argument is that carbon dioxide is creating an energy imbalance. They attempt to measure the energy imbalance, and make predictions about the future. The article is refreshing in that it finally addresses many of my objections about the IPCC. It actually discusses other possible drivers for climate change and tries to provide a compelling argument for why these other drivers of climate are not important. I am less confident than I was before reading the article, but I still have doubts, many doubts. Dr. Hansen made up his mind about the importance of carbon dioxide before most of the research used was performed. He has been an advocate for a really long time. And many of his arguments use data with very short histories. The data displayed about the sun only goes back 40 years. I want to see what happened during the last cooling cycle from 1940 to 1976. Information that went back to the beginning of the Little Ice Age would be even better. The Energy Imbalance discussion uses data from buoys. The changing amount of energy stored by the oceans is used as an indicator that the world is accumulating energy. That it is out of balance. Virtually all of the data used in the calculation is less than 10 years old. It is more a snapshot in time rather than a trend established over a long period of time. And I worry about the data set. There are about 4,000 buoys spread out around the globe. They drift with the currents and too many are near land. Many of the buoys have only been available since 2005. The data is so new and so important to his conclusions that I suspect lots of wild guessing. The article also dismisses all the short term temperature predictions in past IPCC reports. It uses the oceans and the large ice masses near the poles as reasons why the horrible changes predicted have been late. This effectively eliminates one of my main complaints about the IPCC….stupid short term predictions. And they bravely encourage widespread use of Nuclear Power. I think Nuclear power is a necessary part of any green answer. Unfortunately with the exception of China, the world is walking away from nukes. The article paints a bleak picture of the world unless we make the following changes to the way we generate energy. The article advocated carbon trading on a worldwide scale. They advocated widespread use of wind and solar. They advocated widespread use of Nuclear to replace both coal and natural gas generation. Carbon trading requires all the countries of the world to agree. That is unlikely to happen. Without a worldwide agreement, carbon trading only works for the countries that don’t join. Today, China and the USA have a huge trading advantage when trading with the EU because they don’t have to worry about carbon taxes. Wind and solar will continue to be developed, but they have limitations due to Mother Nature. If and when a better battery is developed, their use can expand. Until then, their use will be limited. Germany has so much solar that their power grid is developing reliability issues when solar is not available. Germany’s ability to manufacture goods may be impacted. Germany’s 21st century solution, a brand new coal fired power plant! The world has changed a lot since 2006 when Al Gore won a Nobel Prize for his political commercial masquerading as a documentary film. Dr. Hansen and his cohorts barely got any press for their latest bit of gloom and doom. The world has passed them by. Why? They have been gloomy for a long time. Doom failed to arrive on schedule. Throw in climate-gate and the Mann Hockey Stick debate; the group has lost some credibility. How did they get into this position? They think the science is so compelling that there is no other plausible view. When Dr. Hansen and 17 other scientists wrote the article I am critiquing, they declared there were no competing interests. The world does not have unlimited funds. Every dollar spent on global warming is not spent on something else. Things like world overpopulation, starvation in Africa, AIDS, Cancer, over fishing the oceans, and safe drinking water all have the potential to be competing interests. This group lives on government funds. Every other need of the government is a competing interest. Competing interests go beyond government money. Jobs are at stake in the coal industry. Wind turbines kill birds, including some endangered species. People dislike the appearance of wind mills in pristine areas. Solar panels take up lots of space and must be imported, impacting trade. Nuclear, well it’s Nuclear, need we say more. The carbon dioxide is evil climate group has made many mistakes. These mistakes have given the skeptical community reason to doubt their results. They have been caught cooking data (Climate-gate), adopting questionable scientific theories (The Mann Hockey Stick Graph) and their short term predictions have been wrong. Horribly wrong. They have been too secretive and too vague. They have argued against sharing data with skeptics. If the data is good, they should be doing exactly the opposite. In 2005, the Scientific American wrote an article defending this use of secrecy shortly after the Mann Hockey Stick data began to be attacked by skeptics. The Scientific American defended Dr. Mann aggressively. Interestingly, Dr. Hansen in his new article, appears to argue that the specific temperature conclusions in the Mann Hockey Stick Graph were wrong. The politics has turned against them. A worldwide recession, cheaper and more plentiful fossil fuels, and the Fukashima Nuclear Disaster have changed the political landscape. Global warming advocates are failing because people fear Nuclear Power. Germany and Japan are abandoning their Nukes, only China seems willing to build new Nuclear plants. Long ago they made one very large mistake, they let a politician become point man for the cause, Al Gore. Mr. Gore is driven by political realities. He will never advocate Nuclear Power. Green energy without Nuclear energy does not work. It will not work until a cheap way to store electrical energy is developed. The green community has been advocating a solution that does not work. This is now becoming obvious. They expect the United Nations to be an effective force. This expectation never made sense. Much is made of the original Kyoto Treaty. A treaty that did not work. Carbon emissions soared during it’s implementation period. Kyoto created too many winners and losers. Russia got special treatment. India and China got a free ride. It was politically unacceptable in the USA. China has become significant politically. Any solution must involve China. In a few years China will produce a third of the world’s anthropogenic carbon dioxide. The 2009 Copenhagen attempt at a new treaty failed in large part because there was no way for the world community to get China to do what they felt needed to be done. Absent political concessions in China, the USA will never come on board. The two largest economies in the world must be a part of any real agreement. Stop living in the past. Dr. Hansen has been an advocate of counting all the pollution a country has produced since the beginning of the Industrial Revolution when dictating what each country is obligated to do to stop warming. I personally don’t buy the argument scientifically, but that’s beside the point. This approach has effectively given China a pass. It provides them with an excuse not to cooperate. Global warming hawks need to learn how to compromise. Natural gas is a cleaner burning fuel than coal. While it is not as good as Nuclear as a base load fuel, from a carbon dioxide perspective, it is much better than coal. No new plants are currently under construction. Decades will pas before any new Nuclear plants come on line in the USA. And old plants are being retired as we speak. Dr. Hansen and his cohorts should be adopting natural gas as a lesser of two evils while they wait for technology to provide a better choice in the short run. I would be more convinced by the arguments in Dr. Hansen’s article if Dr. Hansen hadn’t made his mind up about global climate change in the 1980’s. 15 years ago doom was coming and coming soon. His article still says it’s coming, but it could be delayed by centuries. It is a better argument than the immediate gloom arguments of 15 years ago. Unfortunately for him, politicians usually don’t respond to problems in the indefinite future. And still I wonder. Is Dr. Hansen right now….or is he just selectively looking at data to defend a position he has held for 30 years? Only time will tell….lots of time. Just about every hawkish global warming discussion reported in the press begins with the assertion that increases in carbon dioxide will cause a corresponding increase in warming of the Earth’s ecosystem. Man is impacting climate. The proof – carbon dioxide has been changing relatively rapidly since the industrial revolution. Climate theory predicts that carbon dioxide will have only a small direct impact on climate. The amount of direct warming is not generally in dispute. Carbon dioxide is a small molecule and relatively inefficient as a green house gas. Climate science as practiced by the IPCC predicts that changes in carbon dioxide will cause other pieces of the climate ecosystem to react in very specific ways. That reaction is predicted to be significant. It is widely believed (the conventional wisdom of today) that increased carbon dioxide will cause increased water vapor which will cause the world to suddenly warm much more rapidly until a new equilibrium temperature is reached. This positive feedback assumes the climate system is highly sensitive to changes in carbon dioxide. The only confirmation of this assumption is the output of computer models. There is no experimental evidence. It’s difficult to predict how the ecosystem will respond with no spare Earth floating around to experiment on. Climate scientists use complex computer models to predict climate. The IPCC has high confidence in these models. I do not share their confidence. Computer models have problems. One can only model the known. Unknowns are a problem for computer models, particularly important unknowns…..like the Sun. The IPCC says they have a Low Level of Scientific Understanding about the Sun in the 2007 Report. Models begin about 150 years ago which means they all encompass only a period of steadily warming temperatures. The last long cooling cycle (The Little Ice Age) ended about 250 years ago. The period from 1976 to 1998 was one of relatively rapid warming. When the IPCC assumed a high positive feedback from carbon dioxide in their models the models worked better. Carbon dioxide was going up rapidly and so was temperature. One must cause the other? They could not find any other explanation. Perhaps they didn’t look for one. Or maybe it was something they didn’t know about….like soot. A study in 2008 predicted that as much as 18% of observed global warming might be due to soot. The UN’s Intergovernmental Panel on Climate Change (IPCC) has been writing Reports on Climate since 1990. Carbon dioxide has been the culprit in every report. The latest published report is the Fourth Assessment, nicknamed AR4. The IPCC used climate modeling scenarios to predict climate in the year 2100. All Scenarios (B1, A1T,B2, A1B, A2, A1F1) discussed in the IPCC 2007 Summary Report made assumptions relating to carbon dioxide produced by man. The scenarios are not quantified in any other way. No other possible reasons are discussed. Carbon dioxide is the only variable discussed. The bars on the far right indicate the variability of each model at the year 2100. The shading in the graph does not strictly match the bars. I suspect that is so the chart will be easier to read the more likely guesses (oops I mean predictions!). The charts were prepared in 2005. The color stripe in the bar is the best estimate number generated by the IPCC for that scenario. The IPCC Synopses made no predictions about the Scenarios. Which Scenarios were likely? Which were silly? The IPCC preferred not to offer an opinion. When I look at this data, I don’t see computer models that agree with each other. I see scattered data. Scenario A1F1 could produce a 2 degree C change or a 6 degree C change just 95 years after the chart was prepared. One is a change of about twice the rate of the last 100 years, the other predicts six times the current rate of change. The press frequently uses the biggest numbers when reporting. Text associated with the chart stated that the chart only considered 90% of the model runs. 10% were either higher or lower than this chart shows. There are so many things to consider when trying to model the climate ecosystem… and so many things we don’t know. I am not surprised the models don’t agree. Climate modeling is a very difficult task. We are just beginning to understand the oceans and the sun. Cloud formations are still a mystery. Aerosols might be important too. And soot. And air pollution. We have a long way to go. The IPCC admits to all these shortcomings….and then assumes there is a 90% probability that they are right. If recent press reports can be believed the certainty level has risen to 95% in the new soon to be released AR5 Assessment of climate. I must respectfully disagree. If computer models could accurately predict ice ages, or at least the Holocene, I’d be more impressed. The Medieval Warming Period and the Little Ice Age are too difficult for the modelers right now. So far at least, temperature has failed to live up to the theory presented. The 21st century has been much cooler than predicted by the IPCC. Carbon dioxide impacts climate. The notion of the strong positive feedback between carbon dioxide and the rest of the climate ecosystem is an interesting theory….but it’s just that ….a theory. It might be right…but recent data indicates that it is wild high. The world will be warmer than it otherwise would be. But how much warmer…..and from what baseline….that’s a difficult question. And the IPCC is guessing! Yesterday (Saturday December 8,2012), the BBC’s lead story on my browser feed was Climate talks: UN forum extends Kyoto Protocol to 2020. Wow, I can hardly contain my excitement. An agreement that doesn’t work has just been extended. The Kyoto Protocol has always been a bureaucratic solution to the perceived science problem of man caused global warming. The UN has put itself in charge of both the politics and the science. How convenient for them. The Kyoto Protocol divides the world into two main categories, the developed world and the developing world. Countries in the developed world must limit their carbon emissions, the developing countries have no such limitations. The three biggest contributors in the world are China (28%), the USA (16%) and India (7%). China and India are considered developing countries and the USA has not ratified the treaty. The three biggest contributors in the world with 51% of the total are not required to do anything under the treaty. Sounds like a recipe for failure to me. The USA as the only developed country that did not ratify the treaty is frequently blamed for the failure of the treaty. In this article the BBC keeps up that proud tradition. The US – a major polluter – has never ratified the original 1997 protocol. Per capita carbon use in the USA peaked in 1973. As the Huffington Post noted in a recent article, USA production will be the lowest it has been in 20 years in 2012. Yes, the USA uses more than it’s fair share of energy, but that’s true of all developed countries and we are improving. China, according to the Global Carbon Project, produced 28% of the total in 2011 and was growing at 9.9% in 2011. They alone were responsible for .28*9.9% or 2.7% of the worlds growth in 2011. The whole world grew at 3.0% in 2011. This blog is dedicated to the notion that global warming science is full of guesses and questionable assumptions. That said, I believe we are impacting our ecosystem and we should try to do better. We all can do better…and China needs to do more….lots more. China is the big player in the carbon game. In 2011 China had about the same per capita emissions level as the average EU country and their population has a much lower standard of living. China expects to grow their economy rapidly for many more years as their citizens become more affluent. China needs to become more energy efficient. I worry more about air pollution and population growth than global climate change. I consider much of the money being spent by the UN and others to try to control climate, a squandering of our scarce resources. We have our priorities wrong. India will pass the USA within 20 years and become the worlds second leading carbon producer simply by growing their population! The world bank estimates that China has 14 of the 18 most polluted cities in the world. India will soon become the most populous country in the world and it will have a population density about 9 times that of the USA. World population growth and the pollution of the planet are immediate problems that need more resources right now. Saturday the UN extended an agreement that does not work for 8 more years. Next year the 9th International Carbon Dioxide Conference meets in Beijing. So goes the strange world of climate politics.